I have been debating on what to stock my freezer with this spring break. I know I want to give the kids lots of treats, because they will be spending a lot of time outside, and what kid doesn't want a cold snack when they come inside. But, I also don't want to give them something their bodies don't "need" just for the taste. 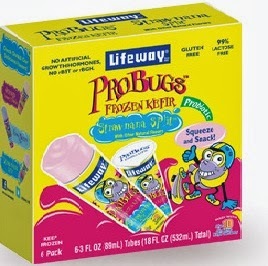 Now your kids can enjoy their favorite Probugs Kefir in a fun new frozen pop! Probugs Frozen Kefir is a creamy, nutritious and delicious dessert that packs 10 live and active probiotic cultures. Made with all natural ingredients and packed with excellent sources of protein and calcium, your little ones will love this tart and tangy treat! You can purchase all 3 varieties at Whole Foods Market and other health food stores.